Our mothers shape us in so many different ways, most of which we don’t realize or come to appreciate until we are fully grown. Their many precious gifts to us include wisdom, strength, a feeling of security, the key to happiness, and unconditional love. 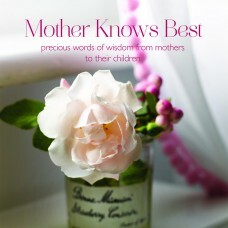 In this soulful little book, adult daughters and sons recall their own mother’s insightful beliefs and words of advice, given in good times and in bad. Some of these words of wisdom are serious, others are lighthearted, and some are practical, but they all come straight from a mother’s heart. The perfect gift from mothers to their children and children to their mothers, this delightful little book is sure to warm the heart and raise a smile.